Record Store Day: How does a vinyl record make a sound? | What Hi-Fi? More and more people are discovering the joys of vinyl. But how does the information on the disc become sweet music? While the basic idea is around 140 years old, thanks to Edison’s phonograph the record as we now know it is more like half that age. Columbia Records launched the first 12in LP in 1948, with the first public demonstration taking place on June 20th at the Waldorf-Astoria Hotel, New York. The rest, as they say, is history. It seems impossible to kill off the vinyl format. It’s a wonderful piece of engineering which, even today, seems just a little too unlikely to actually work. But work it does – and, with the right equipment, to a fabulous level. The side closest to the outside edge of the record carries the right-channel signal. This information can be stored in an area as small as a micron (one-thousandth of a millimetre), so the scale of the task to retrieve it is immense. It’s the job of the cartridge to track the groove. More specifically, it is the job of the stylus tip to do it. The tip is made of a very hard substance, normally diamond. But don’t get too excited - it’s industrial diamond rather than the really valuable stuff. That means it lacks the purity of the gems you might find in jewellery. There are two types of cartridge: moving magnet and moving coil. They both work on the principle of using movement to induce current thanks to magnetic fields. The magnet’s varying field causes current to flow in the tiny coils positioned close by, and this is the signal that comes out the back of the cartridge to be fed into your amplifier. Or, if your amplifier is a line-level device, as many are, a dedicated phono stage. What exactly does a phono stage do? The physical limitations of vinyl mean that the original signal has to be altered before it can be recorded - low frequencies are reduced in level and the highs are boosted. The curve that governs this equalisation was set by the RIAA (Record Industry Association of America) years ago. 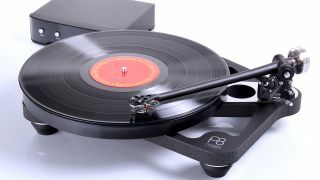 If you’ve ever plugged a turntable directly into a line-level input you know you get a very quiet sound - and also one that is thin and bright, with no bass to speak of. Every phono stage has the reverse response built into it - one that boosts bass and flattens treble to exactly the right degree. The result should be a tonally even presentation. So rather than the witchcraft we always sort-of suspected it must be, getting a sound from a vinyl disc turns out to be nothing more than fiendishly clever. It's worth bearing in mind the ingenuity at play when you next carefully place the tip of your stylus into the groove of a LP - but don't dwell on it for all that long. After all, there's music to be listened to.